This article traces the evolution of a historical journal sponsored by Loyola University Chicago from 1918 to 2002 that in part focused on the Catholic history of the Midwest region. In 1918 in response to the centennial of Illinois statehood the Illinois Catholic Historical Review was founded. Its purpose to ensure that the role of Catholics in the formation and growth of Illinois was properly acknowledged. It came at a time when the Catholic Church was widely identified with foreign-born immigrants. In 1929 the journal changed its name to Mid-America: An Historical Review. Inspired by the work of Herbert Eugene Bolton on borderland studies, and led by an energetic group of Jesuit historians, many of them trained by Bolton, the publication broadened its horizon’s to the role of Catholics in the settlement of the Americas. In the 1960s, however, as that cohort died off, the journal became an American history publication, with a special interest in the Midwest region still apparent. Theodore J. Karamanski. 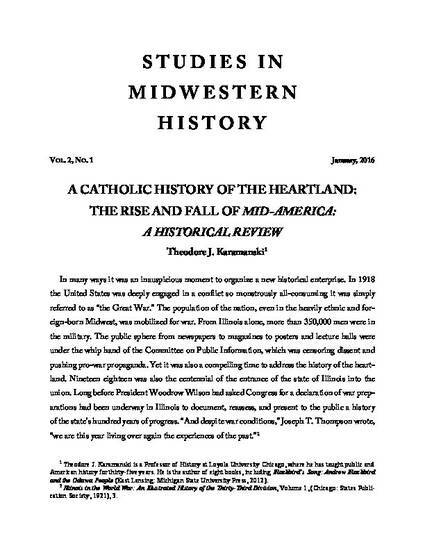 "A Catholic History of The Heartland: The Rise and Fall of Mid-America: A Historical Review"